528 S. Prospect, Park Ridge. 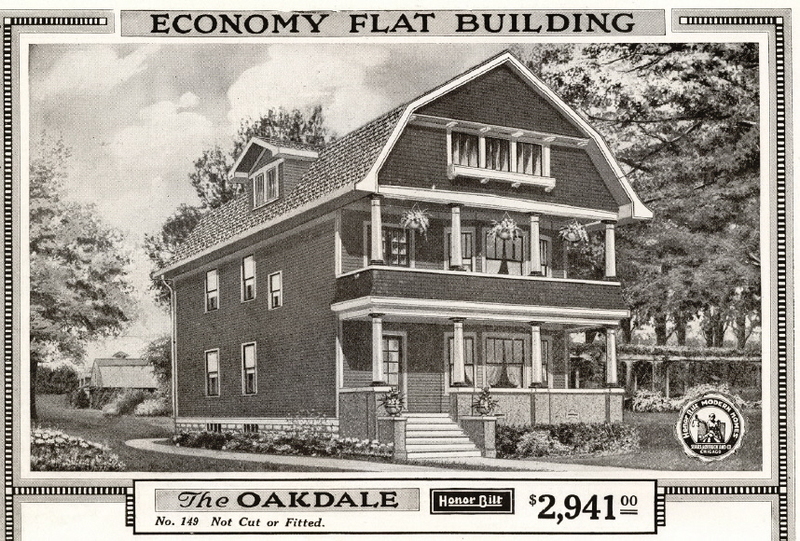 The Sears Oakdale, from the 1918 Modern Homes catalog. The Sears Oakdale (also known as Modern Home No. 149) is a Colonial style two-family house that was offered from 1909-1918. The Cook County Assessor says the Oakdale in Park Ridge was built in 1913. Sears offered several models of multi-family housing, but I'm not sure how many were sold. This one in Park Ridge is the only one I have seen. Uh-oh, what's that in the front window? The property owners have told neighbors that inside the house is beyond repair and it must be demolished. Funny, the outside looks fine. Something weird was going on with the property, however. In 2007 it sold for $704,000 and in 2011 it sold for $290,000. Was it completely stripped inside? So the massacre of 100-year-old houses in Park Ridge continues. R.I.P. No historic district in that town? Yes, Park Ridge can designate historic districts and local landmarks. Their local landmark ordinance is weakened to the point of ineffectiveness because it requires owner consent and the landmark designation can be rescinded by future owners. Essentially there are no laws on the books in Park Ridge that can protect structures or even delay their demolition. Sounds toothless. That's too bad. From the picture the new house looks beautiful! On such a prestigious corner too! Congrats! That's the second nicest McMansion I've seen this week. With none of the character or history of the house that it replaced. If people want to build new, go find a vacant lot and build your dream house. Why destroy something with history to indulge your personal tastes? Lara, I've never seen the Oakdale either. Something fishy is going on about that price. When will people stop destroying America's unique architectural history??? Look, just because something is old doesn't make it "architecturally significant". What was the life expectancy of this particular model? This has been sitting vacant for years, and rumor has it, riddled with asbestos both inside and out. I live nearby and always considered it a hazard. "Character and history"? This is not Frank Lloyd Wright. I wish most of the houses that have been destroyed in Park Ridge warranted the five minutes of discussion this house has gotten on this site. Park Ridge is notorious for two things: airport noise and tear downs of lovely old houses. The residents can choose to remedy one of them. This particular house is representative of a bigger problem. BTW Frank Lloyd Wright properties continue to be demolished every year. Plenty of Sears homes are going on 100 years, well-built with superior building material that beats anything going into McMansions today. If you are a "nearby" neighbor and had heard rumors of it being "riddled with asbestos", I'm sure you were over there to ensure that the asbestos was properly removed before demolition lest that asbestos end up in your house. I have a house that is 100 years old and I wouldn't trade it for any comparable new house out there...And RUMOR has it that its life expectancy is much longer than what they build now. It will be here 100 years from now, unlike the new construction in my neighborhood. One thing is for sure, what they build in place of the tear downs will never live long enough to become "architecturally significant". Going by the architectural horrors of some of the new construction in that neighborhood, no wonder some neighbors can't differentiate between what is architecturally significant and what is not. What's fishy about it? The real estate market crashed in 2008 - seems pretty self-explanatory. Anyone ever looked in the windows of that place? Looks completely stripped. Probably another indicator of the price point. I thought McMansions were when people bought multiple lots and built houses three-times the size of their neighbors? Is that happening here? Did these people buy the neighboring lots too? I've never seen a house's value tumble from $704k to $290k in the Chicago market before, simply because of the market forces. Hey, Anon, if you peek in there again, get some photos! I did not want to trespass. McMansions is about the size of the house relative to the lot, not the number of lots. A gutted house in 2008 was worth over $700,000? Right. Anybody know how big the new house will be? Actually yes, 2007 was height of market and tear-downs in PR were going in high 600s and even 7s depending on lot size. So...plenty of Sears homes are well built so this particular house because its a 100 year old Sears house is well built? And some McMansions are built nowadays with inferior materials so the new house being built on this lot is being built with inferior materials? I'm not defending anyone in either direction, but I hope you are basing that on some facts known about this actual house, otherwise that chain of reasoning doesn't hold much water. Actually met the owners. Whole house was covered externally in asbestos, inside the house too. They did have it properly disposed of which is probably more than most would do. Saw the tents a few weeks ago. In this instance, it is only an important fact if it is a fact with respect to the house being blogged about not just a generalization. Point being, that some of the opinions listed here may be coming from uninformed people if no one knows what the actual condition of that house is. Have any of the posters ever been in it or know anything about its habitability? If so, please post. BTW, you actually can get cypress wood for building materials nowadays (per quick google search). Ugh, lost my post. Cypress (esp. Florida) not the same today due to federal restrictions. I guess you could say that most lumber not the same today as 100 years ago. Anyway I wonder why this house is garnering so much interest. Dozens of houses were torn down in Park Ridge this summer. Why the need to rationalize/justify this new construction? The bottom line is... another Sears house gone (and a somewhat rare model). I just wanted to document it and grab a photo before it was gone to hopefully help other researchers in the future. I am sad the house fell into such disrepair and has to be knocked down. The prior owners gutted it in a manner that compromised its structural integrity and made it not only unsafe to be in but stripped it of its original zoning so it couldn't be restored accordingly. Not to mention the asbestos. Its why it sat for 3 years on the market. After 8 years of vacancy, would neighbors really rather continue to see the building sit and rot then be developed? Anon, thanks so much for your comments. This is what I suspected, but had no basis to report.